Home > Ask Our Experts > What if a Witness to Will Dies Before You? If one of the witnesses to my will dies before I do, does this invalidate the will? The law regarding probate (that is, the process by which the validity of a will is tested, and the assets relating to the will are disbursed) is a particularly complex area. The number of individuals who fail to make a will is concerning; it is perhaps just as concerning that a significant proportion of those who do make a will fail to do so in a legally viable manner. Amongst the most important concerns for a testator (that is, the individual making the will) is the provision of proof that the document that will be presented to the probate courts is genuine, and accurately describes their wishes. 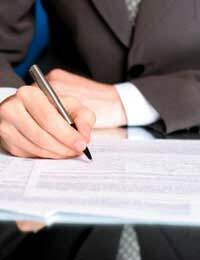 A particularly important safeguard here is the process of witnessing; in order to be deemed valid, the signing of a will must be witnessed, and the witnesses must attest to the mental stability of the testator. It is inevitable, however, that some cases will be complex even when these procedures have been followed exactly. It is perfectly possible, for example, that a witness to the will may die before the testator. In the first instance, it is worth noting that the easiest way to avoid potential confusion is to adjust your will accordingly; produce a new version (which may be sensible anyway, depending on when your original will was written) and have it witnessed by another person. This can help to ease the eventual process of probate. That said, the death of a witness does not necessarily invalidate a will. At the outset of probate proceedings, if the witnesses have not survived, the executor will be required to produce proof that the original witness signatures were valid, as well as proof of the witnesses' deaths. Clearly this can be difficult; there is no cohesive guidance on the nature of this proof of validity, although proof of death is easy to produce. As such, rather than tempting fate you should consider adding new witnesses to your will in the event of the death of the original witnesses. However, you should be reassured by the fact that wills are rarely challenged; probate authorities understand the problems faced by executors and beneficiaries, and use their discretion accordingly. Are Executors legally obliged to adhere to preferences expressed in a Will as to whether a body should be interred or cremated? What is the situation if witnesses and/or executors change address? They simply inform the relevant organisations and other people involved of their new address.